by your attempt to bake your videotape. Dealing with 'sticky-shed tape syndrome' has been one of our ongoing concerns. We receive weekly calls from VCR owners with clogged video decks caused by sticky tapes. When tapes have been stored for many years in an environment with humidity above 45%, the binder on the tape releases, causing 'sticky-shed syndrome'. This causes tapes to stick to the VCR's transport path. VCRs suddenly slow down during playback, video heads clog, and the whole tape path gets gummed up. An extremely informative article written by Eddie Ciletti 1 put us on the right track. He outlines how baking tapes can restore their usefulness for a few weeks. This gives you a reasonable window of time to transfer your tapes to digital. The food dehydrator recommended in Eddie Ciletti's article has been discontinued by the manufacturer. 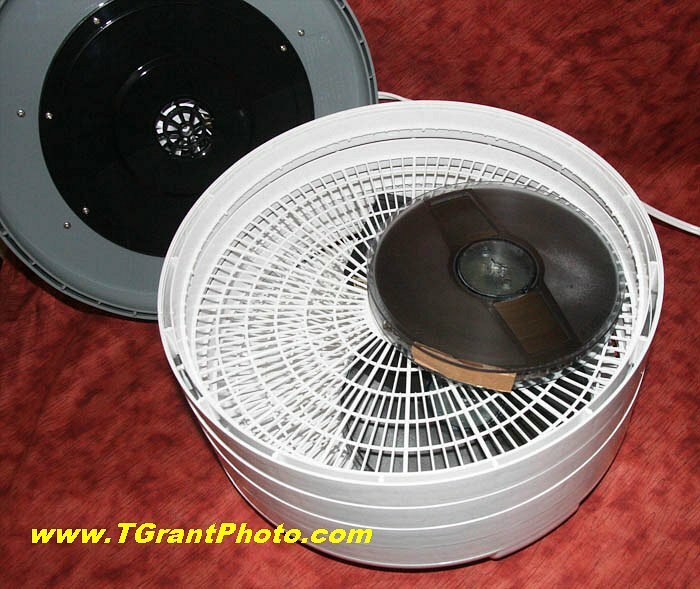 However, TGrantPhoto stocks a specially modified food dehydrator. 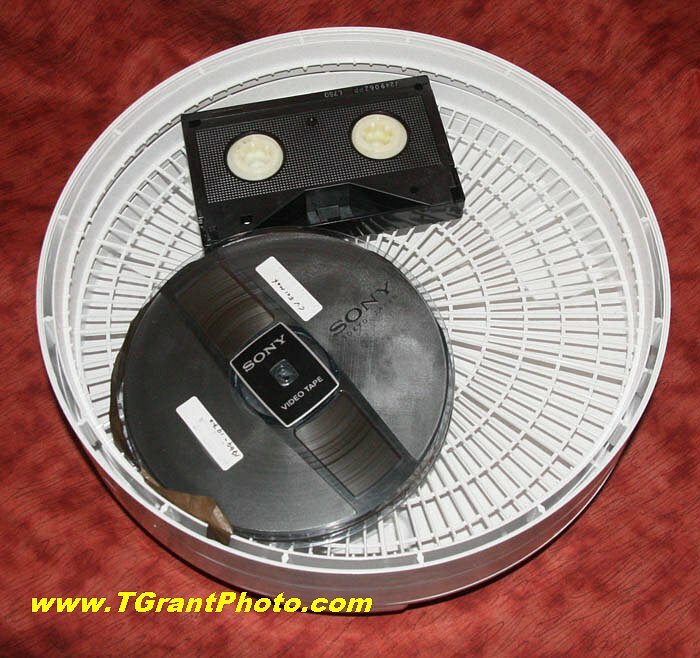 It comes with two modified circular trays that allow tape baking use by videophiles. Warning: Don't even consider using kitchen ovens, microwave ovens, or other baking options. 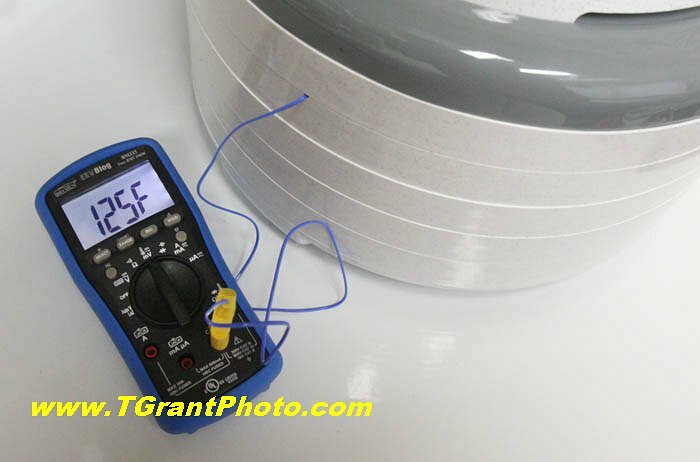 They have wide temperature swings that will damage your tapes. The dehydrator slowly bakes out the moisture in the tapes, this restores the tape binder so it's playable for a few weeks. 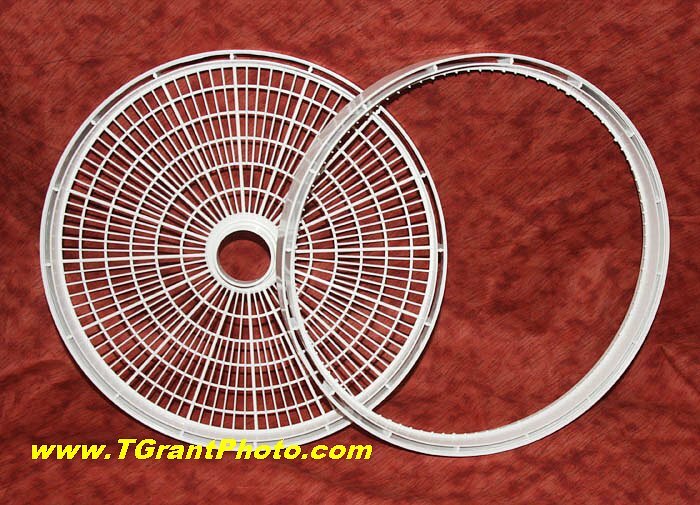 To accommodate your video tapes, our modified dehydrator has two 'spacer' rings. With the rings in place, the modified dehydrator can now accommodate VHS cassettes, 1/2" reel video tape and Beta cassettes. If your videotape covers the center hole in the rack, don't be too concerned. In our experience there's enough airflow around the tape to allow the baking to continue properly. Below, a reel-to-reel video tape sits on one rack, while other tapes are on the rack below. Cut a small slot in one of the tray edges to allow the probe wire to reach inside. Position the temperature probe tip in the center of the dehydrator. In the absence of a multimeter, you can try a Taylor digital kitchen thermometer It's a digital thermometer with a metal probe, and at about $10 it proves to be reasonably accurate. However, it might be cumbersome to install and difficult to read. In our tests 125°F seems to be the ideal baking temperature. 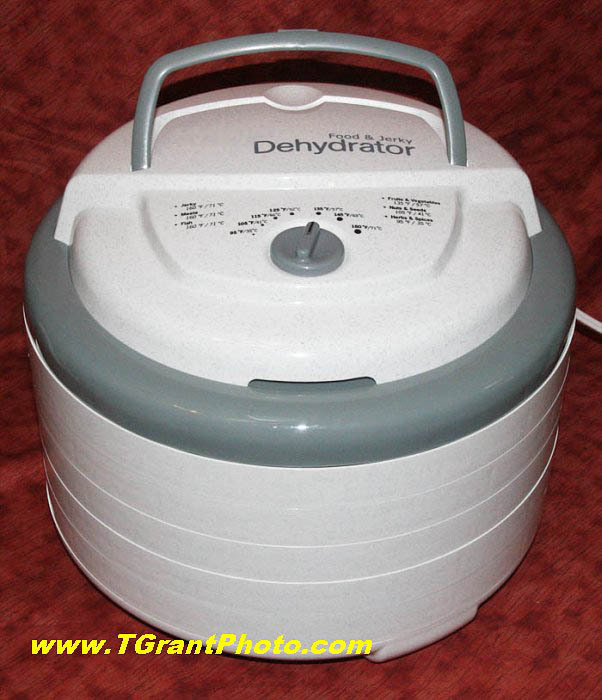 Set the dehydrator's temperature dial to achieve the desired temperature. If you're baking a reel-to-reel videotape, secure the loose end of the tape with plastic clips or a small piece of cardboard. This will stop the tape from unspooling as it bakes. VHS and Beta tapes can be safely baked while in their cassettes, disassembly is not required. Once the dehydrator's temperature has stabilized, it usually stays within 2-3°F of the desired 125°F. In case you're concerned, 125°F won't melt the plastic tape reel or videocassette housing. Warning: Don't leave the house while the dehydrator is running. 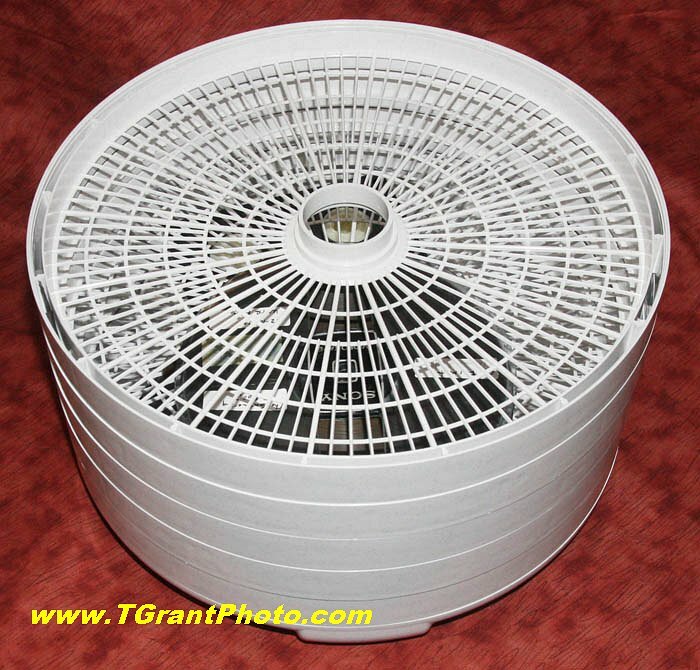 Place the dehydrator on a non-flammable surface, such as the metal top of a clothes dryer. The underside of the dehydrator reaches about 108F while baking. Allow your tapes to bake for about 8 hours, flipping the tapes once or twice during the process. Try not to peek in at the tapes as they bake, this quickly changes the temperature inside the dehydrator. Allow the tapes to cool for a day before attempting to play them. You'll find that the results are remarkable. Tapes that would formerly stick and deposit residue now play like new! Note: This article is solely for informative purposes only. We cannot be held responsible for any damages to your tapes or VCR caused by baking your tapes. The above content is copyright TGPSales & TGrant Photo. Copying or use on another website is prohibited. 2 It's doubtful if any acetate videotapes were ever produced for the home market, and if they were, they would surely be reel-to-reel videotapes. Acetate tapes look very translucent when the reel is held to the light and viewed from the side. A length of acetate tape will snap easily when it's pulled quickly, polyester tapes stretch.